Remember when I received this little goodie box in the mail? 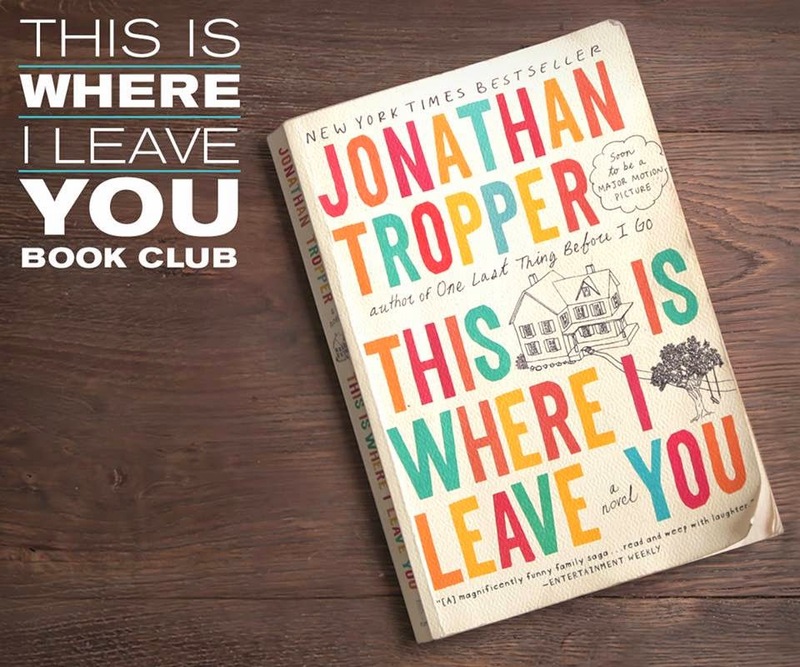 Last night, my book club finally met to discuss THIS IS WHERE I LEAVE YOU by Jonathan Tropper. I absolutely loved this novel (both times I read it), and I couldn't wait to share to share it with my friends. I wasn't alone in my admiration of this book -- all of my friends loved it too! Because THIS IS WHERE I LEAVE YOU is near and dear to my heart, I thought I should host an event "worthy" of this book. We had an absolute crazy weekend, but I managed to throw together a pretty decent feast if I do say so myself. 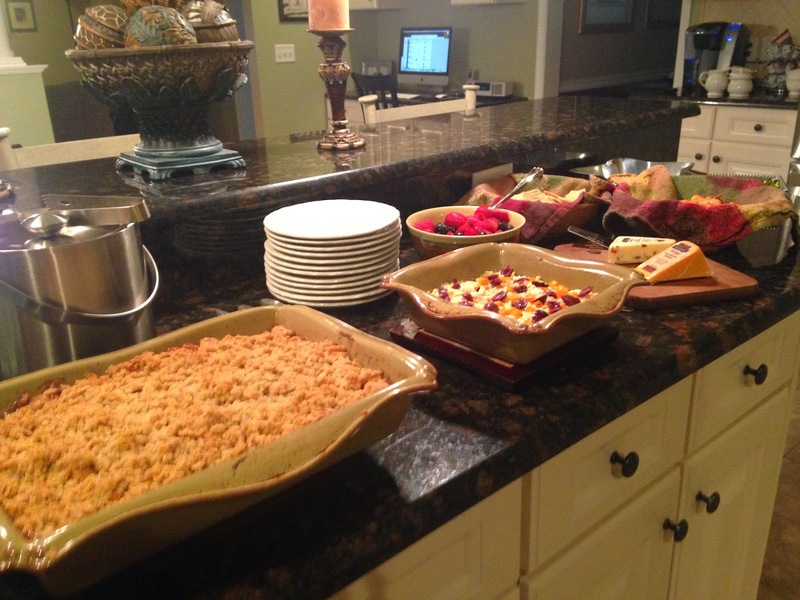 We had the Barefoot Contessa Old-Fashioned Apple Crisp with vanilla ice cream, pumpkin cream puffs, a variety of cheese and crackers, fresh berries, and a delicious Layered Hot Artichoke and Feta Dip. We also had mint iced tea and wine! I had the discussion questions available just in case we needed them, but we had no problem finding things to talk about. This guide includes a great interview with the author along with ten thought-provoking questions. Some of the themes we focused on include family dynamics, parenting, love, marriage, tragedies, sibling rivalry, resentment, selfishness, and forgiveness. It was also interesting to discuss Judd's recurring dream sequences although I'm not entirely sure any of us were one hundred percent sure what they meant! If I'm being honest, my book club tends to get off track quite a bit when we discuss our monthly books. However, our conversation for THIS IS WHERE I LEAVE YOU was really, really good. In fact, we discussed THIS IS WHERE I LEAVE YOU for over two hours and that's a really long time for us. We covered almost all of the topics in the discussion questions, and we managed to have a great time sharing wacky experiences with our own families. I think that's one of the reasons that this book is so perfect for book clubs -- it reminds us of our own families... and makes us feel more normal! I planned on taking pictures of my group discussing the book or even a group photo of us holding the book, and I totally forgot! So all I have is this picture of me with the book! Giveaway alert: I have a $25 Visa gift card for you to see the film in theaters along with a copy of the book. To enter, just fill out the form below before September 28th at 11:59 p.m. EST. I will randomly select and notify the winner the following day. This contest is open to those of you with U.S. addresses only. Good luck! Post sponsored by Warner Brothers. Apple crisp and pumpkin cream puffs? That's awesome. Can I come? Your book club evening sounds like a real hit. Maybe I should have my club give it a try. I wish I could have been there to enjoy some of that food! My book club loved this book too - there's so much to talk about. I can't wait to see the movie! Sounds like a fund evening! I'm going to save your food list! What fun ... I wish I could be a member of your book club! 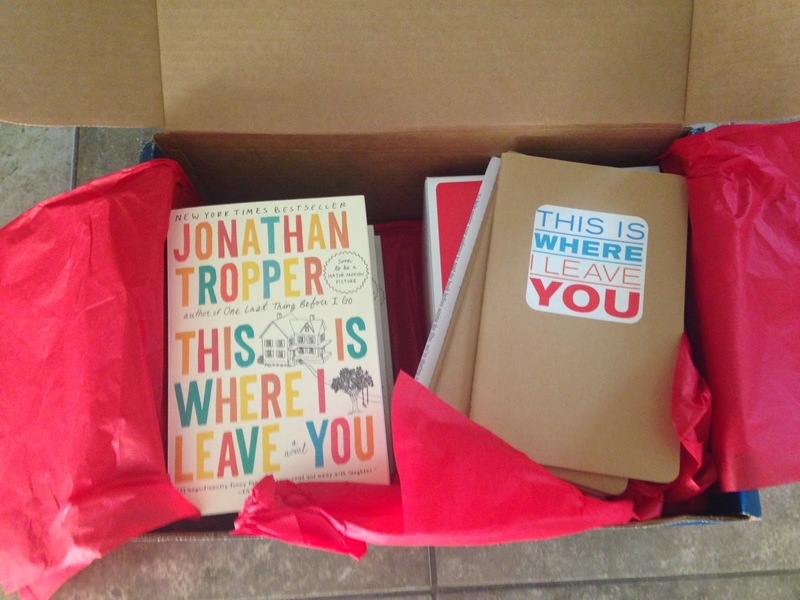 I would love to read "This is Where I Leave You". I need some good reads now that the weather is getting colder and before you know it, we will have snow. Wow, I want to attend your book club. I may be one of the last ones to read this book! My friends and I read TIWILY and saw the movie yesterday! I'm hoping you can help us with a question we have - in the book, how was Horry hurt? Thanks for your help. Looks like a great book club night!